One Week in Beijing: My Experience, Your Itinerary » Lavi was here. A trip to Beijing is not for the faint-hearted. 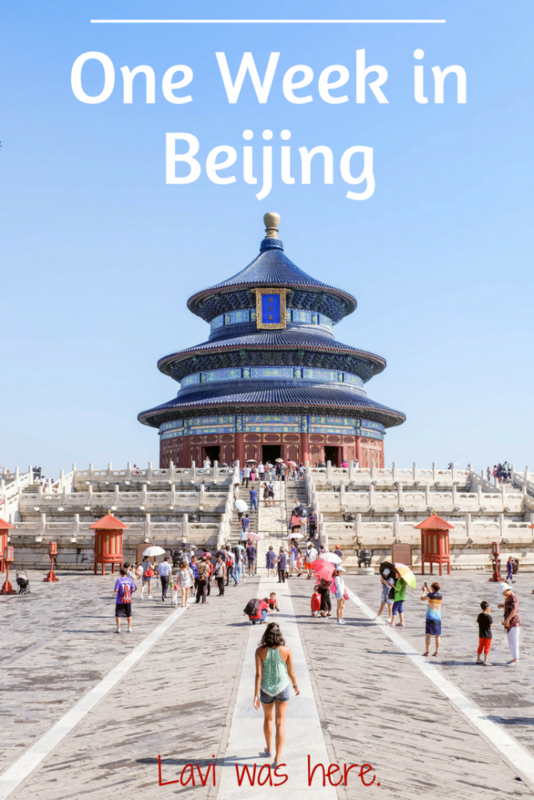 There is so much to see and do in Beijing, China, that planning the trip can be overwhelming. But trust me, Beijing is worth it. If you’re going to fly halfway — or all the way — across the world, you might as well make it count. Once you’ve read up on everything you need to know before you go, it’s time to plan the itinerary. You can fit a lot in one week in Beijing, if you do it right. My 5-day trip to Beijing and Xi’an was action-packed and had its fair share of hiccups, but the journey was both incredible and unforgettable. You can do it in five days, but a week would be ideal. Allow my experience to help guide and plan your itinerary! We arrived in Beijing in the early afternoon. I thought we’d have plenty of time to get settled in our hotel and hit the ground running with our exploration. I realized that we probably should have done a little more research on communication and transportation. We fell into the oldest tourist trap in the book. Unsure of the best way to get from the airport to our hotel, we took a taxi. Not just any taxi, but an unmarked taxi. Basically, we just got in a car with a guy who had a taxi meter app on his phone. Heed my Beijing travel tips post and warnings — there is a better way! Fast-forward to the end of our trip in which we were in love with the metro system and took the metro to the airport express train. It cost us a fraction of the time and price of the taxi on the way to Beijing. The lesson was quickly learned after paying way too much for that taxi. We also quickly learned the lesson of not booking a stellar hotel in Beijing. There are tons of hotel possibilities in Beijing, but believe me when I say that a 3-star hotel is really a 1-2 star hotel by most peoples’ standards. After assessing the smoky, dingy hotel room we’d signed up for during our stay, we adopted the acronym YOIBO (You’re Only In Beijing Once) and booked a room in a much better hotel, the Grand Millennium Beijing in the Central Business District. Crisis averted, and after checking in and eating some delicious dumplings, we were back on track for an amazing trip. I’m not sure if I’ve ever walked more in one day than our first day in Beijing. I legitimately was limping at the end of the day from walking so much. Michael and I were super excited to see and do everything, and we certainly started it off with a bang. One of the many UNESCO Heritage Sites in Beijing, the Summer Palace is one of the most beautiful and expansive city parks I’ve ever visited. It was built in the early Qing dynasty around 1750 and was used as a space for rest and relaxation as well as a residence for royals. We walked around the park for hours, exploring a fraction of the over 3,000 structures of the 1.1 square mile park, including ancient temples and the beautiful lake in the middle. We took a boat across the lake and marveled at the natural beauty combined with the intricate architecture of the ancient buildings. Our first tourist sight in Beijing did not disappoint. I highly recommend spending at least half a day walking around the Summer Palace. Walking through the different temples and ancient structures was remarkable; each served a specific purpose to the Chinese royals at the time. Michael is a fan of Confucius, so the Confucius Temple was a must-visit after the Summer Palace. The Beijing temple is the second largest Confucian temple in China after the temple in Confucius’ hometown. Officials and followers paid their respects to Confucius at the Beijing temple, which holds rows upon rows of ancient stone tablets with inscriptions from scholars and beautiful, intricate gated entrances. It was a peaceful visit in comparison to the crowded Summer Palace. A trip to Beijing isn’t complete without a visit to Olympic Park, home of the 2008 Olympics. Actually, Olympic Park wasn’t high on my list of places to go in Beijing, but it was exciting to watch the Olympic buildings light up as the sun set. Hundreds of visitors walked along the promenade between the Bird’s Nest and the Water Cube buildings. Imagine excitement and chaos during the actual Olympic Games! Of course, we went to the Great Wall of China! It rained all day and was foggy almost the entire time, but the few moments in which we had a clear view of the wall extending over the mountains made it so worth it. We arranged for a taxi from our hotel to take us to the Mutianyu section of the Great Wall. It’s said to be less crowded than the Jinshanling section, which is closer to Beijing. We would have liked to explore the more wild, unrestored section of Jiankou, but the unrelenting rain kept us on the beaten path in Mutianyu. We donned our ponchos and took the cable car up to the Great Wall. Stepping foot on the Great Wall for the first time was surreal. It’s amazing how easy it is to get up close to such an ancient part of Chinese history. Luckily, the rain meant fewer tourists, though there were still quite a few people visiting at the same time as us. We walked up and down the wall in search of a clear view amidst the thick clouds, and when it finally came, the view was breathtaking. It took over one million laborers to build the Great Wall, which spans over 13,000 miles and is well over 2,000 years old. The amount of labor and effort that went into constructing this wall is absolutely incredible. I wish I could say that the Ming Tombs was worth it. Sigh. You can’t win them all. But really, miscommunication with our driver and not enough research led us to a visit that wasn’t worth the drive. Of the mausoleums of 13 emperors of the Ming Dynasty, only three are open to the public, as well as the Sacred Way, which is a road with animal sculptures on either side. That’s the part of the Ming Tombs that I really wanted to see! We ended up only paying for one tomb — the tomb that wasn’t near the Sacred Way — and we were going to have to pay extra to drive to see it. Fatigue and disappointment at the first Ming tomb set in, so we headed back to Beijing instead. It was a miss on our part, but if we’d planned it better the Sacred Way would have been awesome. Our days were so full of action that we were exhausted by the end of the day. We opted for culinary exploration at the Donghuamen Night Market, where we snacked on spicy scorpions and dumplings. I’ve always been a sucker for street food and Beijing’s night market didn’t disappoint. The tiny alley was flanked with little stalls of starfish, scorpions, and mystery meat of all kinds. We grabbed a few beers afterward in Sanlitun, one of the popular neighborhoods for nightlife in Beijing. A relaxing ending to another busy day! If you have one week in Beijing (or more) and can spare a day or two away, a trip to Xi’an is a must. Xi’an is where you’ll find the Terracotta Army, a collection of terracotta sculptures of the army of the first emperor of China. The collection consists of over 8,000 soldiers, all with unique facial features that depict real soldiers. Some were fat, others were thin, and they had different hairstyles, uniforms, and ranks. The collection is unlike anything I’ve ever seen. It really made me think about who each soldier was and what it was like to live during that time in China. 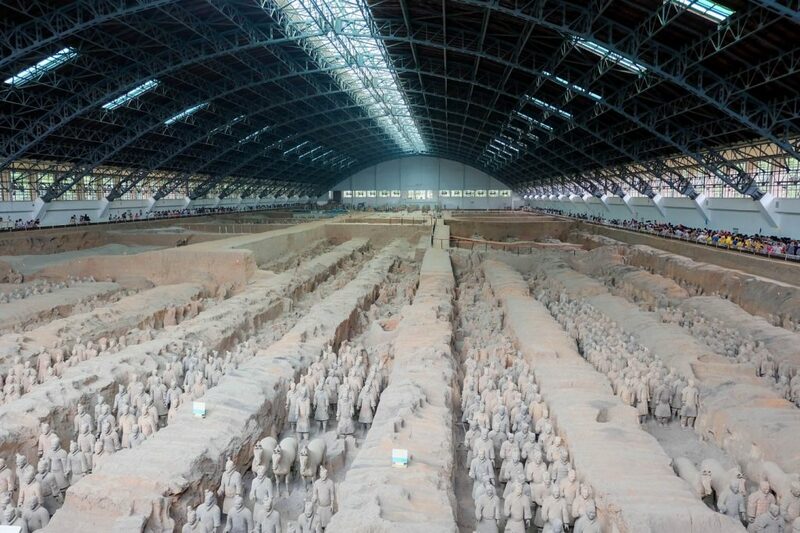 The Terracotta Army was built as part of the mausoleum of the first emperor of China to protect him. It also includes chariots, horses, and various types of soldiers. Excavation is still underway and pieces of the soldiers are pieced together, bit by bit. Definitely get a guide on-site at the museum so you can make the most of your visit and learn about the history of the collection. Hot pot is one of the most satisfying meals you can have, and it’s even better in China! We were starving after walking around the Terracotta Army museum all day. 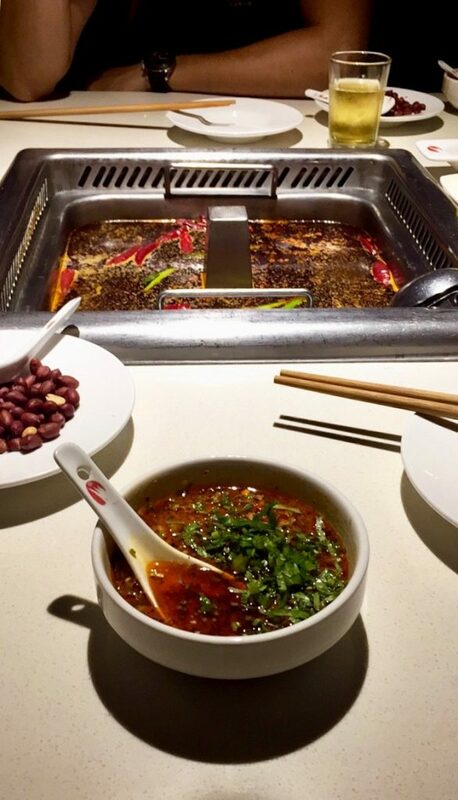 TripAdvisor recommended Haidilao Hot Pot in the heart of Xi’an. It was hands-down one of the best restaurant choices I’ve ever made. But it didn’t seem like it would be at first. We were seated on little plastic stools in a crowded room and given a snack that tasted like Chex Mix along with some juice that was way too sweet. We were the only non-Chinese people in the room and it took us a little while to realize we were actually in the waiting room. The actual restaurant was so big! The entire floor of the building was full of tables of people laughing and enjoying cooking meat and veggies in the steamy broth simmering in the middle of their tables. We had our own attendant to help us order and make sure we were satiated. We donned our aprons and dove into ordering more than we could handle. Our broth was spicy, even by my standards, and I live for spicy food. At times I thought my throat was closing in on me, but the delicious food and lively atmosphere were unparalleled. I hit snooze on my alarm and groaned as I opened my eyes and realized it was still dark outside. It was around 5 am and our flight back to Beijing was in about two hours. With the unreliable WiFi and email access, it is a miracle my inbox was able to refresh and that we found out our flight back to Beijing was canceled. One look out the window told us everything we needed to know. The rain was pouring down on Xi’an in unrelenting buckets. Our plans to return to Beijing with enough time to visit the Forbidden City were shot. 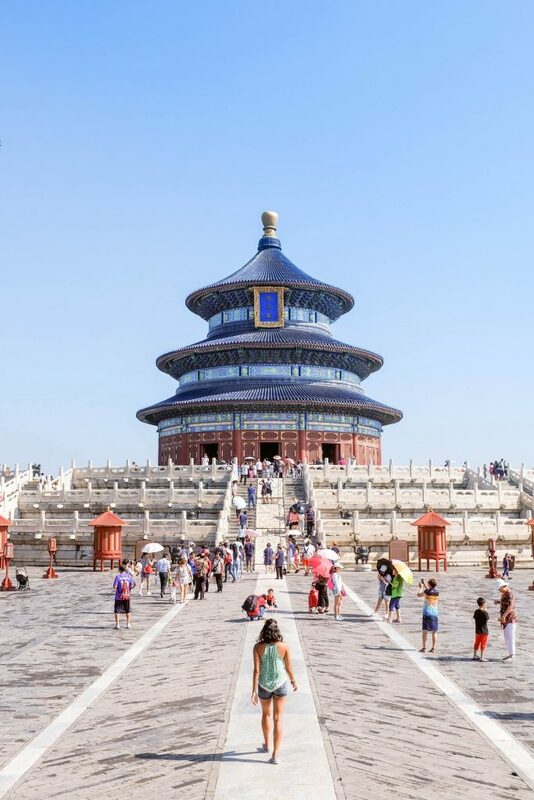 We would have to pack in both the Temple of Heaven and the Forbidden City the next morning all before heading to the airport around noon to catch our flight home. But first, we had to get back to Beijing. Prices for the next available flight were expensive, so we opted for the bullet train. It took about 4.5 hours to travel ~750 miles. I took in as much as I could of the rain-smeared view of the Chinese countryside out the window as Michael slept. Although it was frustrating to have to pack in the sights on our last day, the soft sway of the train made for a soothing, unexpected journey. And at least we made it back to Beijing in time for dinner! It was our last meal in Beijing and we wanted to go out with a bang. It would be Peking duck or bust. We made reservations at the restaurant at The Opposite House, a gorgeous, trendy hotel that looked like it would be a dream to stay in. The meal was incredible. Another brief history lesson: Beijing used to be called Peking. The duck is roasted by being hung in an oven and sliced in front of the diner. It’s eaten in a thin pancake with bean sauce, cucumber, and spring onion along with sauces. 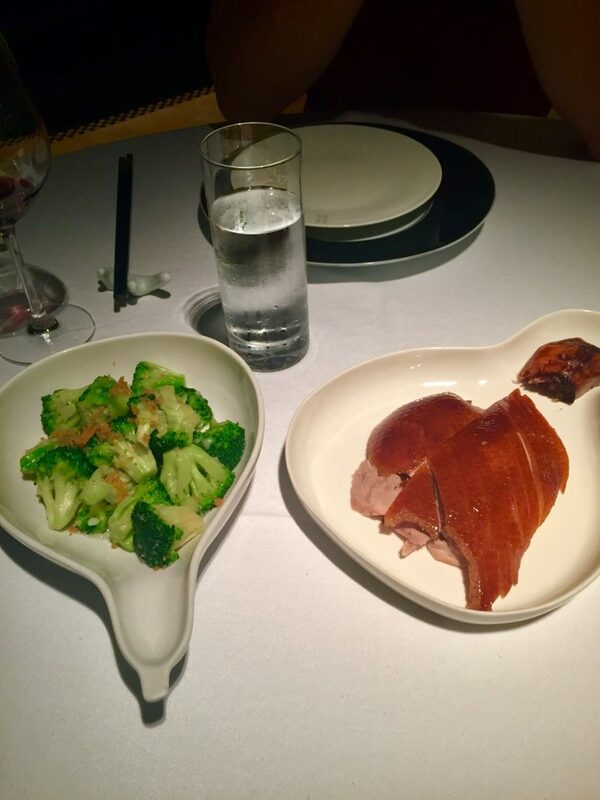 Yes, it can feel awkward to see a duck hanging and getting roasted, but yes, it’s delicious. Peking Duck is a traditional Beijing dish from the imperial era; you can’t have second thoughts about what the royals ate! From the wine to the food, this Peking Duck dinner was the perfect date to end our Beijing trip. The rains from the previous day burned off the Beijing smog as we awoke to blue skies for the first time all week. 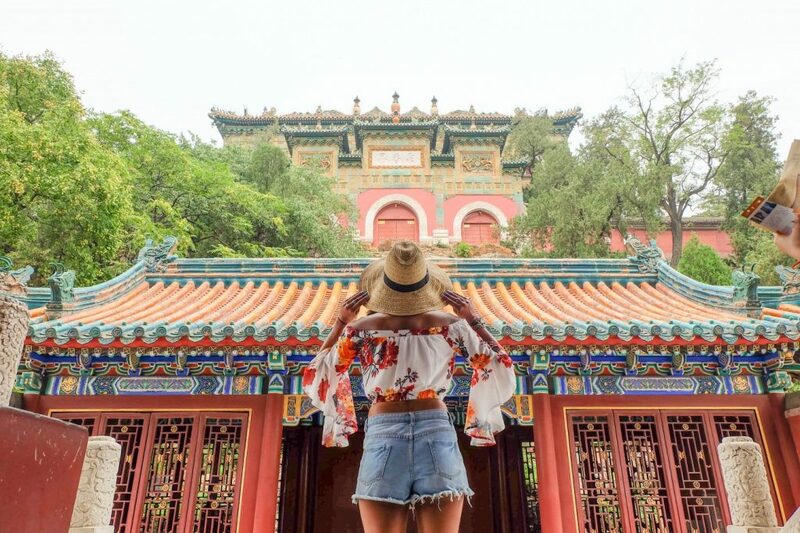 It was our last half day in Beijing and the gorgeous weather had us anxious to see the sights we had outstanding on our list. Emperors of years past used to visit the Temple of Heaven to pray to heaven for good harvests. This beautiful and serene green area is dotted with temples and religious complexes. The temples were adorned with symbolic references to the four seasons, earth, and heaven and the vibrant colors of red, blue, green, and gold shined bight in the morning light. It was easy to see why the Qing and Ming emperors chose the Temple of Heaven as their praying grounds for the good of their community. Knowing what I now know about how long it takes to see the Temple of Heaven and Forbidden City, I would’ve visited the Forbidden City first. Visiting the Forbidden City alone takes hours, and we only had about one hour to do it! We could’ve spent the entire day exploring this beautiful area. Smack-dab in the middle of Beijing is the Forbidden City. 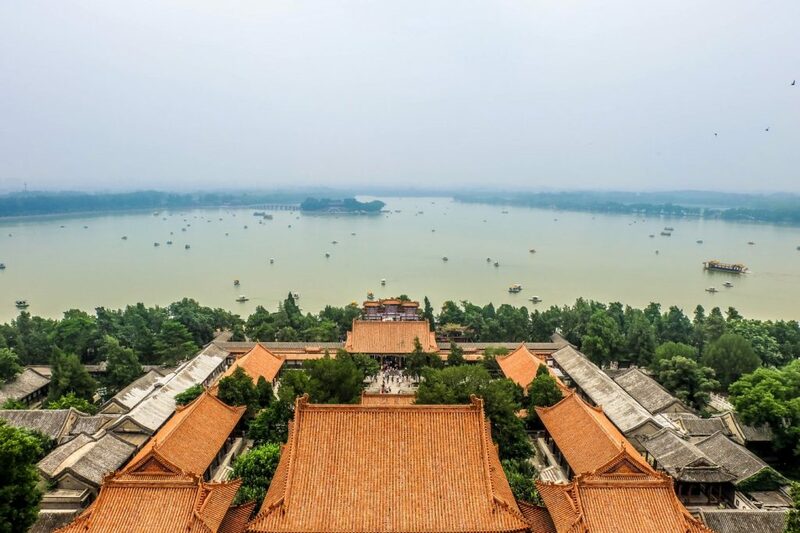 It houses the Palace Museum and consists of almost 1,000 buildings. 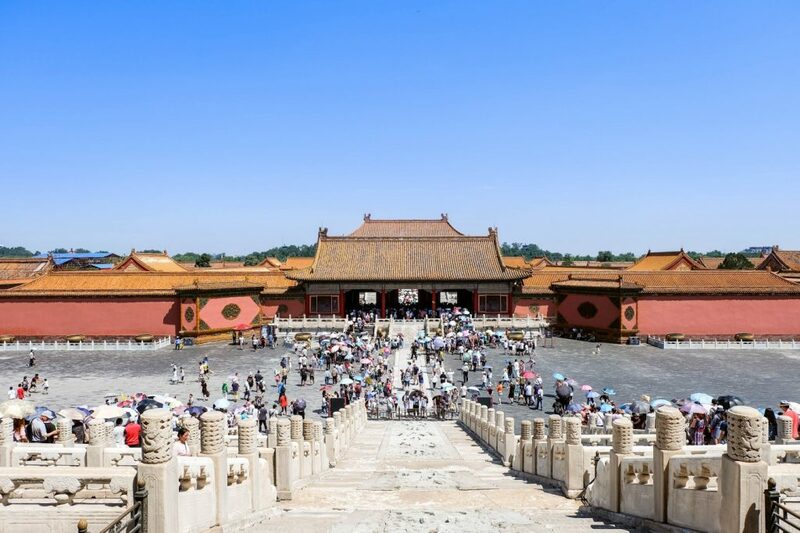 The former palace during the Ming and Qing dynasties, the walled Forbidden City is where you’ll find countless ancient artifacts and beautifully adorned structures. We ran through throngs of people to try to see as much as we could, but we only saw about half of it, and very quickly. It broke our hearts to tear ourselves away, but we simply didn’t have enough time to see all the buildings and the aerial view from the north side of the Forbidden City. If we were to repeat this Beijing trip, there’s nothing I would have done differently, except visit the Forbidden City before the Temple of Heaven. 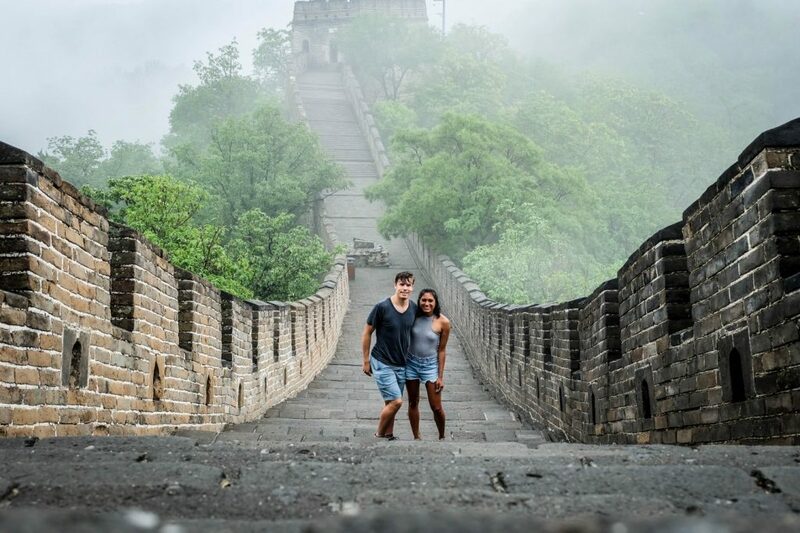 We had to make the best of our one week in Beijing despite the canceled flight, long train ride, and few hours spent figuring out our hotel situation. However, if we had more time, I would’ve wanted to stroll around the 798 Art District and discover more of the local scene. 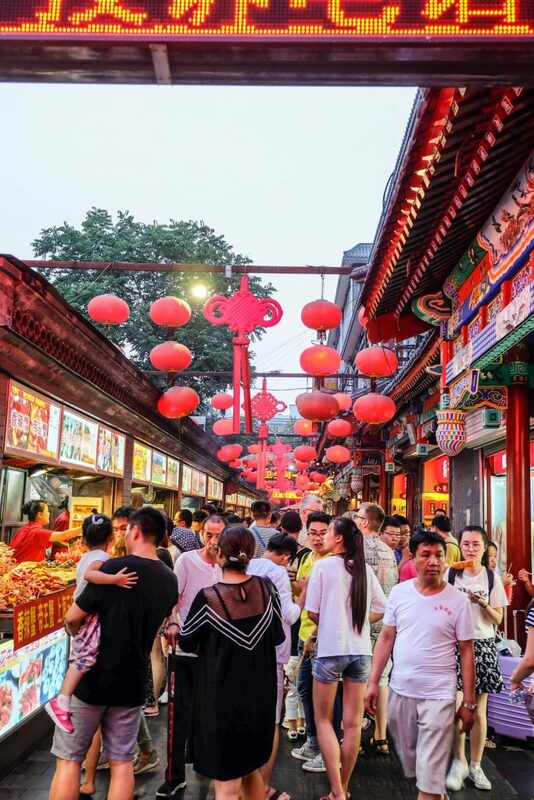 One week in Beijing doesn’t allow much time for anything other than seeing the main sights, but if you do it right, it’s one memorable cultural experience you’ll feel lucky to have. What a great trip, thanks for sharing your adventure! WOW,Great trip,glad that you able to take such a wonderful trip. When is the one week in Albania tour? Inspiring and informative, thanks for sharing with us. Look forward to visiting the Great Wall one day. Oh, I love the ancient architecture of the Forbidden City in Beijing. 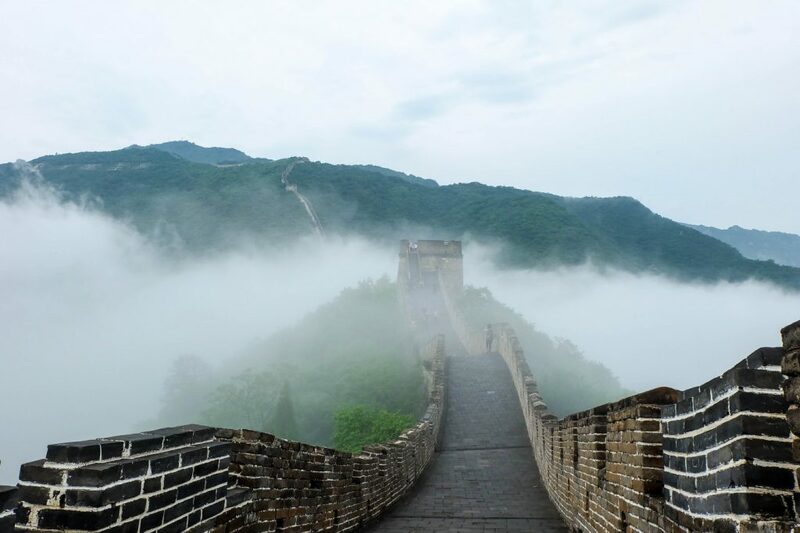 Your post makes me feel desired to travel to Beijing immediately. Thanks so much for your sharing!